Britney ei ole vielä päättänyt, jatkaako sopimustaan esiintyä ainoastaan Las Vegasissa vai tekisikö välillä jotain muuta. Britney kertoi E!Onlinelle myös hieman tulevasta albumistaan. I just spoke exclusively to the pop star at the Teen Choice Awards and she confirmed she may not renew her residency at The Axis at Planet Hollywood. If she doesn’t strike a new deal, her last performances of Britney: Piece of Me will take place later this month through October with finals shows happening over New Year’s Weekend. Brit marked her 100th show on Friday night. As I previously reported, a new contract is currently on the table. And let me tell you, Britney looks amazing. She stunned in a Frozen-inspired cleavage-baring Mikael D dress, Le Silla heels and Jennifer Meyer jewelry. 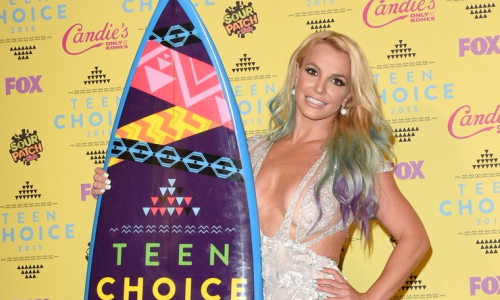 Spears also recently announced that she will guest star on the upcoming seaosn of Jane the Virgin.